When Cadbury started mixing things up with their chocolate, collaborating with new flavours and such, I was sceptical. Why mess with a good thing? If it ain’t broke, don’t fix it. However, when I tried their Oreo chocolate, it was a bit of an eye-opener to say the least. Their distinct milk chocolate fused with that unmistakable cookie flavour was a taste sensation. 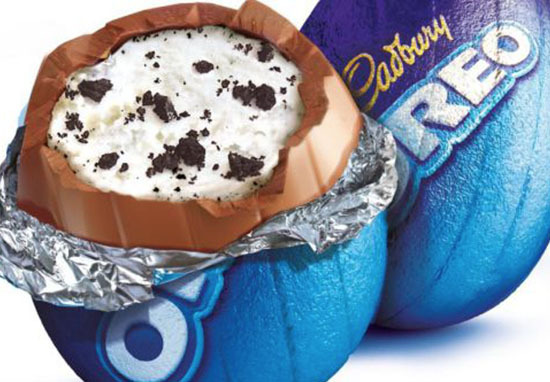 Cadbury has now announced yet another mash-up, taking the Oreo chocolate one step further by turning it into a Creme Egg. You know, the famous chocolate eggs with that gooey white and orange centre, well that’s now going to be a concoction of Oreo goodness. And it’s not just for Easter, they’re hitting shelves in January. Ok, so it’s not technically the first time Cadbury have tried this, as there was a mini egg version earlier this year. But a full-size version is not to be sneered at, a bit like finally seeing the movie after months of teaser trailers. Neither can I Aislinn, neither can I. In another classic chocolate being turned into another form of classic chocolate move, those little, deliciously moreish M&M’s are being transformed into a new range of chocolate bars. Among the flavours will be peanut, almond, crispy, mint, and of course, the classic milk chocolate. We’re equally passionate for the launch of M&M’S Hazelnut Spread Chocolate Candies next year. We’re thrilled to deliver this new flavour with colour and fun, in a way that only M&M’S can. The new M&M’s bars will be available from December, right in time for Christmas, obvz. Not feeling either of these new offerings? Here’s another weird but wonderful mash-up of chocolate goodness with something… else. A deep-friend Terry’s Chocolate Orange! I know, you never asked for it, but here we are, so let me tell you about it. Adam’s Bay, a fish and chip shop in Gainsborough, Lincolnshire, have created their own twist on the classic sweet treat just because they could, really. The eatery asked customers for suggestions of what new dish the shop should try next, and the answer was a deep-fried chocolate orange. Among the other popular options were battered mince pies, a battered yule log, and a battered Christmas pudding. Well, Christmas is a time for feasting, so I’m down with this.